The Most Dangerous Environment is a Correctional Facility; your Correctional Facility. CAGE is the most Effective Way to Address this Threat. During this initial course we will go into the philosophy of CAGE and the proven hard nosed methodologies used to identify, investigate and manage the nations most violent and organized criminal street gangs incarcerated in your local correctional facility. Additionally, we will begin to learn about the fundamentals of establishing a corrections gang unit and the methodologies used to operate an innovative, effective and efficient unit that is aggressive and intelligence driven. We are going to share with you the insights of industry professionals that have established some of the most successful corrections gang units and teach you how to build an operation your Command will praise and the inmates will never see coming. 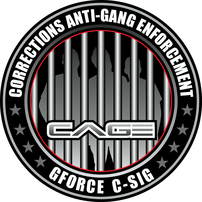 Earn your "CAGE Methodologies" Certificate of Attendance from The Gang Enforcement Company's National Gang Academy; today! Correctional Housing Unit: Gang Members will take advantage of shift change to attack or retaliate against rivals. Having a robust intelligence gathering operation within your correctional facility can drastically increase your ability to stop these incidents before they happen. These incidents are a threat to the officers, fellow inmates and the security of the facility - not to mention the financial impact.